This weekend I got the chance to visit a Korean food festival here in Toronto and since then I have been thinking about Korean cuisine. While I was there I got to watch a chef make some bulgogi which is definitely one of my favorite Korean dishes. Bulgogi is a dish where the meat it marinated in a sweet, salty, spicy and all round flavourful marinade that uses many classic Korean ingredients. Over the last while I have made several versions of bulgogi including beef bulgogi , pork bulgogi , chicken bulgogi , and even a pineapple chicken bulgogi (which I use to make some Korean/Mexican fusion tacos al pastor ). I had been thinking about trying a salmon bulgogi for a while and now was the perfect to to do so. For the salmon bulgogi recipe I simply used the bulgogi marinade recipe that I have been using for a while now. One of the things that I like about this recipe is that it uses a Korean/Asian pear to add sweetness and help tenderize the meat. Normally bulgogi meat is cut thinly and cooked in a pan or even a grill pan but for salmon fillets, I had to go with roasting them in the oven. I could not stand to see all of that tasty marinade go to waste so while the salmon was in the oven I simmered the marinade in a pan on the stove top and then I spooned it over the salmon before serving it. When I make other types of bulgogi I often use the meat in Korean/Mexican fusion dishes like tacos, burritos, quesadillas, etc. but this time I just wanted to enjoy the salmons buttery, melt in your mouth goodness. 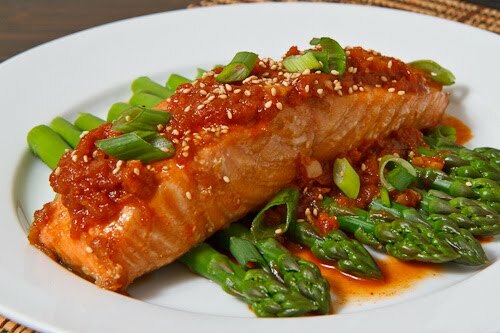 I served the salmon bulgogi over some simple steamed, in season asparagus to make it into a nice light meal. Mix everything in a freezer bag and marinate for a few hours in the fridge. Bake in a preheated 375F/190C oven until the is cooked and it flakes easily with a fork, about 8-12 minutes. This is a fantastic way to serve salmon Kevin. Very cool. WOW, i have never ever heard of this, and it looks fantastic! A perfect summetime treat! I will have to google gochujang and hopefully we have it here in NH or VT. Great job! I love pork bulgogi because of the spices, so I know that I will love it over salmon…especially since salmon is in season in Washington. LOVE bulgogi! Never thought about it with salmon. Salmon bulgogi is such an original idea! My boyfriend and I eat Korean quite often and I recently took my parents and grandma who all loved it. This is a great take on it that I can't wait to try. I love how creative you are. And I LOVE how you put twists on Korean food. As a Korean who loves Korean food, I appreciate the different ideas. I love the sweet pairing with the salmon! Bulgogi sauce is so delicious. I do not have a big knowledge of Korean cooking. This bulgogi looks incredibly tasty; I did not know the dish before. Thanks for presenting it! That, Kevin, is a beeeeeeautiful piece of fish! The flavors must be thru the roof! mmm, that sounds fantastic! And I love how you've served it on those gorgeous asparagus! I'm definitely going to try to make this. My family loves salmon, but we always use the same old chinese recipe and frankly, I'm sick of it. kevin – thank you for your kind words on the book. that meant a lot to me. we need to have you in the next one you know. regarding this dish: all i can say is i wish i had access to all the fabulous spices you always get a hold of. i mean i would love to see your spice cabinet alone. have a good weekend buddy. Really clever use of Bulgogi-looks sensational and tasty. My husband I tried out this recipe and it rocked… Great way to capture the Korean flavors and a bit more healthy catalyst for the sauce than short ribs and the like. Thanks for the tasty dinner or five! thank you for such a delicious idea. i tried it last night with a dinner party and it was an overwhelming success. i'll be adding this to my short list of "regulars". proportions were perfect!